In 1673, Ann Martin Edmonds, a healer from Lynn with Boston associations, appeared before the Court of Assistants on witchcraft charges, but here the script changes. After hearing the evidence, the Court dismissed the case against Mrs. Edmonds and instead tried her accusers, Samuel and Sarah Bennett of Boston. Ann and her husband, William, were the chief witnesses against the Bennetts; the Court of Assistants ended up fining the Bennetts and ordered them to reimburse the Edmondses for their court expenses. Whether she be one or no, I know not, but she has ignorance and malice enough to make her one. And indeed she has done very odd things, but hitherto such as are rather strange than hurtful; yea, some of them are pretty and pleasing; but such as I think cannot be done without the help of the Devil – as for instance, she will take nine sticks, and lay them across, and by mumbling a few words, make them all stand up on end like a pair of nine-pins. But she best have a care, for they that use the Devil’s help to make sport, may quickly come to do mischief. I have been told by some, that she has actually indentured with the Devil; and that he is to do what she would have him for a time, and afterwards he is to have her soul in exchange! What pains poor wretches take to make sure of Hell! 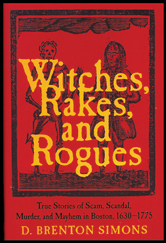 Adapted from Witches, Rakes and Rogues: True Stories of Scam, Scandal, Murder, and Mayhem in Boston, 1630–1775.